In recent years, as the bandwidth and the speed of networks have increased significantly, a new generation of network-based applications using the concept of distributed computing and collaborative services is emerging (e.g., Grid computing applications). The use of the available fiber and DWDM infrastructure for these applications is a logical choice offering huge amounts of cheap bandwidth and ensuring global reach of computing resources . 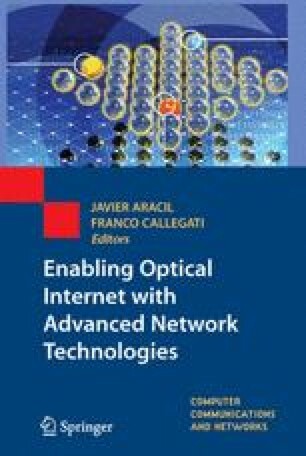 Currently, there is a great deal of interest in deploying optical circuit (wavelength) switched network infrastructure for distributed computing applications that require long-lived wavelength paths and address the specific needs of a small number of well-known users. Typical users are particle physicists who, due to their international collaborations and experiments, generate enormous amounts of data (Petabytes per year). These users require a network infrastructures that can support processing and analysis of large datasets through globally distributed computing resources . However, providing wavelength granularity bandwidth services is not an efficient and scalable solution for applications and services that address a wider base of user communities with different traffic profiles and connectivity requirements. Examples of such applications may be: scientific collaboration in smaller scale (e.g., bioinformatics, environmental research), distributed virtual laboratories (e.g., remote instrumentation), e-health, national security and defense, personalized learning environments and digital libraries, evolving broadband user services (i.e., high resolution home video editing, real-time rendering, high definition interactive TV). As a specific example, in e-health services and in particular mammography applications due to the size and quantity of images produced by remote mammography, stringent network requirements are necessary. Initial calculations have shown that for 100 patients to be screened remotely, the network would have to securely transport 1.2 GB of data every 30 s . According to the above explanation it is clear that these types of applications need a new network infrastructure and transport technology that makes large amounts of bandwidth at subwavelength granularity, storage, computation, and visualization resources potentially available to a wide user base for specified time durations. As these types of collaborative and network-based applications evolve addressing a wide range and large number of users, it is infeasible to build dedicated networks for each application type or category. Consequently, there should be an adaptive network infrastructure able to support all application types, each with their own access, network, and resource usage patterns. This infrastructure should offer flexible and intelligent network elements and control mechanism able to deploy new applications quickly and efficiently.